Drinking your way through Austin, Texas sounds like a really good time to me. However, if you’re only in town for a weekend there’s no way you can go everywhere. That’s why we relied on our friends, Kym and Gidget- Austinites and seasoned professionals- to dig up the dog-friendly bars and scoop us on their favorites. Here are their Top Five including a special mention of Rainey Street. Located in ‘Way South Awesome’, Moontower will leave you with no doubt that you are in Texas. Texas flags and wooden armadillos are the predominant decor, and though the bar is dog-friendly both inside and out, most of the seating- picnic tables, custom benches and booths- is outdoors. Moontower has a wide selection of craft beers at great prices, as well as yard games, bands, food trucks, and sand volleyball courts. Staff friendliness trickles down to the patrons. Everyone here loves what they do and all the people are having a good time. DOGS? Yes! We love dogs. Dogs are awesome. Dogs must be on a leash and under the owners control at all times and should be socialized and well behaved in the company of other dogs and people. Fresh drinking water provided on site. Owners clean up “accidents”. Dog waste bag stations provided free for our patrons. Located in Central Austin in the North Loop area, Workhorse is the perfect neighborhood bar. Most of the patrons, friendly and obvious dog lovers, live within a few blocks. You won’t feel like a stranger long, as the staff will quickly learn your name and what you like. Their bar food ranks far above most, and behind the bar you’ll find one of the best bartenders in Austin as voted by the readers of the Austin Chronicle in the their Best of Austin poll in 2013. Ask Jason for his superb whiskey sour. 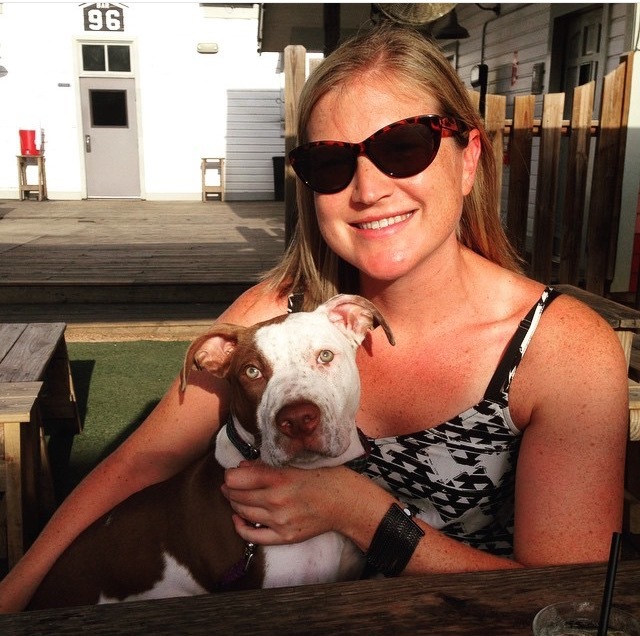 Though dogs are only allowed on the patio, you can walk your pup through the bar when you enter. Feel free to pause long enough to order a drink, then make your way to the cozy back patio. Sometimes you want go where everybody knows your name. In Austin, that’s Workhorse. Corner Bar is located in South Austin off South Lamar. Dog friendly inside and out, this is a great spot to catch up with friends or watch a game. Multiple TV screens feature all your favorite sports with MLB, NHL, and NBA packages, as well as NFL Ticket. A BBQ trailer stands out front and there’s a taco trailer out back. If you need another food option, Austin Pizza is located next door. For in-house snacking there’s a popcorn machine. Patrons can be a bit sloppy and your pup will no doubt discover the ground at this bar is covered in edible gold. Then again, free popcorn is a pretty great dog treat and ‘foraging’ for one more piece will keep your pup focused and happy. A new addition to Austin in 2015, The Wheel is another neighborhood bar off the beaten path in East Austin. Located in a small plaza with Juiceland and Austin Daily Press, you have a wide variety of snack options. Solid cocktails, craft beers and a daily whiskey for $4.00 make this a no brainer for anyone in the neighborhood, but we also recommend it for out-of-towners looking for a local experience. Their water fountain, designed using different local beer taps, might be the coolest thing we’ve ever seen. If wine is your thing, then Aviary Lounge will be your favorite new spot. Marco, co-owner and dog guy, is great at helping you find the perfect glass of vino just by chatting. He has dogs; you have dogs. You should bring your dogs and talk about them over a lovely glass of rosé. In addition to the great conversation, wine, and tapas, everything in the lounge is for sale. Like the furniture you’re sitting on? You can buy it. Think the art would look great on your wall? Put it on your tab. Aviary is a total departure from everything else on this list and a highly recommended treat! Rainey Street isn’t a bar; it’s a whole street of them. 15 at last count. Many of the establishments are converted from old houses and all are dog-friendly. If your drinking buddy is a pooch, this is your bar hopping dream. You’ve got the Uber app, right? Start on the North end with Bar 96, a great sports bar with yard games out back and dog treats ready and waiting. Next stop is Bungalow, where you can enjoy a tasty alcohol-infused popsicle or snow cone while your dog makes friends with everyone they meet. From there, head to Container Bar. This place is built out of individual shipping containers that you, your pup and all your friends can claim. Shut the door and let the dogs run wild while you enjoy the AC and a beverage. Across the street from Container Bar you will find Icenhauer’s. If it’s Sunday, you should order a giant mason jar of sangria for $7 and stick around for their feature band, The Night Owls. Hit Bangers for the enclosed dog run and dog sausages (made for dogs, not from them), but don’t get trapped. With Smoke-out Saturdays, Big Band Brunch and Mega Mutt Mondays, Banger’s is well-known for a reason. They’re professionals. Continue on to Lucielle. It’s another great indoor/outdoor space with yard games and plenty of opportunities to socialize. Last but not least is Craft Pride, with more craft beers, many local, than you can shake a stick at. Be sure to take your pooch out back where you will find the Via 313 pizza food truck. If you’ve made it this far, you will be in need of some of the best pizza in town. Known for their square, Detroit-style pies and a variety of toppings, we highly recommend The Cadillac. Inspired by World Pizza Champion, Tony Gemginani, it’s topped with Gorgonzola, Fig Preserves, Prosciutto di Parma, and a Parmesan/ Balsamic Glaze. If you are hungry for something other than pizza, there are two food truck parks and additional trucks at some of the bars. To satisfy your sweet tooth, be sure to check out Little Lucy’s donuts. Named after the owner’s pitbull, Lucy, these hot and fresh mini donuts are the perfect ending to a perfect day on Rainey. Kym Good moved to Austin, TX in the fall of 2011 and immediately fell in love with the area. She enjoys being outside and staying on top of the city’s ever-expanding list of food and beverage offerings. 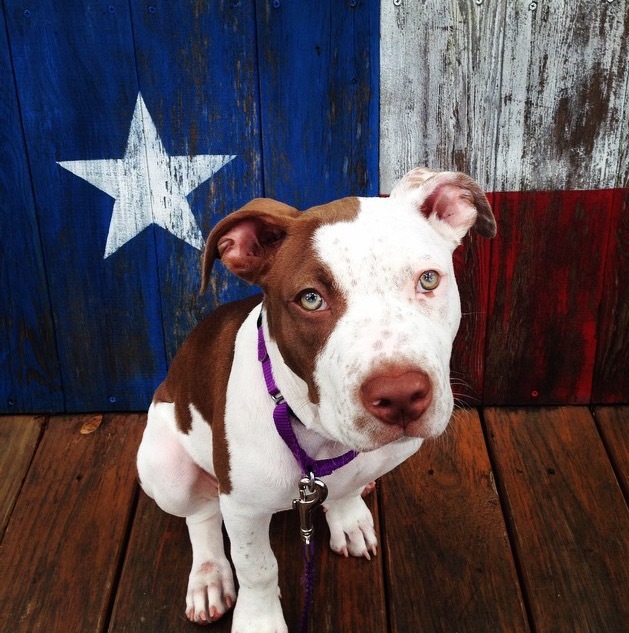 Gidget is a 6 month old Staffordshire Terrier mix from Austin Dog Rescue. Named after the 1959 surfer movie, Gidget was the runt of the litter but by far the most energetic and playful. Aptly named, she is the perfect companion for going out on the town, and always an advocate for pit bull type dogs and rescue. They share their home with 14 year old Bean, who is also a bull terrier mix. You can follow their adventures on Instagram @GidgetThePitget.